View More In Barbecue Seasoning. A natural rich brisket flavor and the brisket moisture are the main things that cooks look for when eating. If your cooking for a competition or in your back yard our Prime Brisket Injection has been awarded the highest prize possible to win the BBQ World Food Championship. All taste palates are different, so strengthen to your taste. Ingredients: hydrolyzed vegetable protein (hydrolyzed soy and corn protein and salt, with partially hydrogenated vegetable oil [cottonseed, soybean] added),beef, beef stock, monosodium glutamate, sodium phosphate, and xanthin gum. Note: We recommend starting with 3/4 cup of injection to two (2) cups of water. Other options are to split 1/2 the water with beer, apple juice, Cola or beef broth. 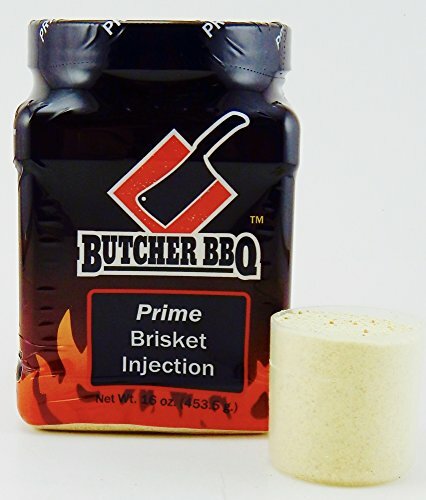 We have taken science and cooking, combined them and made this simple to use injection for any cook can use and make your best tasting brisket ever. Features: Type: Prime Beaf Injection. Includes: 1 lbs. Gluten Free. This package will do up to 8 briskets. Choice of Champions "Trust Your Butcher"
If you have any questions about this product by Butcher BBQ, contact us by completing and submitting the form below. If you are looking for a specif part number, please include it with your message.